Lindsay Shaw pitches a strike against Marcus in a previous game. Photo by Mark Slette. With the home advantage, the Cowgirls headed out to Cowgirl Stadium on Friday with a victory in their sights. Host to the Teacher Appreciation Night, the stands were nearly full as Coppell residents came for the rivalry match against Flower Mound Marcus. However, Marcus jumped on sophomore starting pitcher Lindsay Shaw for four runs, defeating the Cowgirls 4-3. Lindsay Shaw pitches a strike against Marcus on Friday. Photo by Mark Slette. Marcus went up to bat first, scoring two easy runs in the first inning. Not to be outdone, infield senior infielder Erika Zimmer hit a single and was plated on a double from senior centerfielder Katy Bryan. The next three innings were more competitive as both teams were put on at a scoring standstill. Sophomore outfielder Julia Sircar reached first base, but could not cross home plate before the Marcus defense turned three outs. In the fourth inning, things got intense as freshman catcher Madi Traver threw it to senior first baseman Lindsay Stivers who tagged the first base in order to claim the third out. Stivers again made a play as the first hitter of the bottom of the fourth with a double. Marcus seniors Audrey Pratt and Whitney Wolkow stacked the bases with good hits in the fifth inning, but a pair of flyball catches by Bryan and Sircar made it two outs, putting the stress on Marcus. A ground ball hit to shortstop senior Clare Madden and a throw to Stivers at first base finally got the Cowgirls out of trouble. 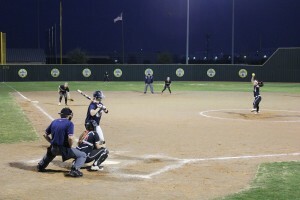 Sircar lofted a ball into centerfield that landed her a double, which when aided by teammate Zimmer helped her head for home and land the cowgirls an even game two to two. In the seventh inning Pratt and senior Ashley Hardin fly into home plate because of a hit by junior Bonna Molina. Coppell fires back on offense with a triple by freshman Mia Hermans, and singles by both sophomore outfielder Ali Gentry and Traver.This makes the nail biting game separated by a run with Coppell having loaded bases and two outs. Emotions ran high as the score was four to three. Sadly, Marcus defused the Coppell threat and won the game. the Cowgirls did not come out on top, but Coach Krug did not regret the way the game ended. “We were good defensively, we came out strong,” Coppell coach Katie Krug said .”The girls played hard, they played until the very end. We played them much better this game then we had the prior game,” Krug said.